Dig a cylindrical hole twice as wide and slightly shallower than the root mass or 24” deep; loose soil at the bottom of the hole should be firmly tamped. Fill hole with water and let it drain completely. Fill again. If the second filling takes longer than 12 hours to drain, there is inadequate drainage. See Appendix A for three methods of dealing with a drainage problem. Ideally, acceptable water drainage is from 2”- 6” per hour. Carefully remove the growing container so as not to disturb the soil attached to the roots – See Appendix B for a safe technique. It’ll speed establishment if exposed roots at the bottom of the root ball are pruned off. This step should not be disregarded and is especially important when the quantity of roots is so high that they form a dense mat at the bottom of the container. This is commonly referred to as being “root bound” and often occurs with vigorous species such as is the case with many deciduous fruit trees (apples, peaches, plums, apricots, pomegranates…) as well as some avocados and citrus. In some cases I recommend the removal of as much as 50% of the root mass formed at the base of the container. Keep in mind that pruning roots promotes new root growth, which in turn helps establish the plant in the soil. Locate the plant in the center of the hole so that the top of the root mass is at least 3” above the surrounding soil (with time it will lower to the soil level). Backfill with a mix of 50% topsoil and 50% planter mix such as SUPERSOIL brand Palm & Cactus mix. 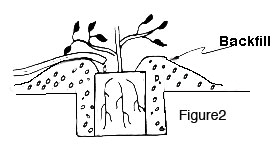 Create a temporary watering basin by mounding the soil as shown in Fig. 2. As a general rule, newly planted evergreen fruit trees & shrubs should receive monthly applications of a balanced fertilizer (such as Citrus & Avocado fertilizer) from March – October. A slow release fertilizer such as brand name Osmocote 4 month release or equivalent can also be used at 1 tablespoon per gallon of backfill. Deciduous species typically perform well with infrequent (2-3 times annually) low – nitrogen fertilizer applications such as brand name Grow-Power’s 3-12-12. Avoid fast release fertilizers so as not to burn the root system. 1.Trickle irrigate directly over the roots for about 30 minutes twice a week (see figure 2.). 2. After eight weeks, widen the watering basin out to the tree’s drip line as shown in figure 3. Reduce the watering frequency to once a week for the next two months. Avoid standing water next to the tree’s trunk. 3. A once a month watering practice can be followed from now on. Remember to apply water deeply for each irrigation. 1. Mulching – A 3” thick layer of leaves, compost or commercial mulching material is always beneficial; keep mulch away from trunk. 2. Paint the lower portion of the tree trunk with either a white color water based latex paint or a commercial tree paint. This protects against sunburn damage. 3. Shelter – Many tropical fruit trees need protection from strong winds, intense heat, freezing temperatures for at least a year or two after planting out – see Appendix C for recommended shelter structure. B. To remove container first cut out the bottom of the container with a knife or pruning shears. Then make a vertical cut beginning at the bottom 2/3 up the side of the container – do not remove the sides, this will keep the soil intact. Place into planting hole and fill half way with backfill. Now finish cutting the pot and carefully slip the pot away from the root ball. Complete backfilling. C. Shelter – Use shade cloth as shown; it provides sun protection, wind and about 2 degrees F frost protection. The top may be covered with 50% shade cloth. Do not use clear plastic.